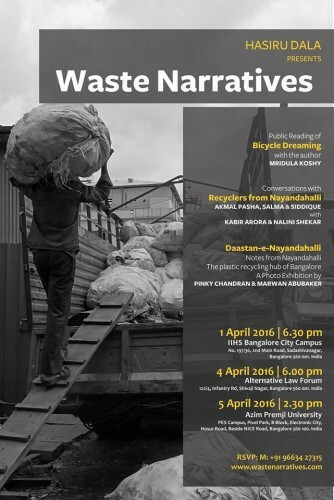 Hasiru Dala invites you for Waste Narratives being organized at Indian Institute for Human Settlements, Alternative Forum and Azim Premji University (Dates and Timing Mentioned Below). Waste Narratives is an evening comprising of public reading of the novel Bicycle Dreaming with the author Mridula Koshy, Conversations with the recyclers Akmal Pasha, Salma and Siddique, Mallika, Zareena, Kokila and Annamma and the premier of the photo exhibition of Daastan -e- Nayandahalli: Notes from the Plastic Recycling Hub of Bangalore, by Pinky Chandran and Marwan Abubaker. The idea of curating Waste Narratives is to rethink our understanding of informal and informality. The event seeks to throw light on the role played by informal waste workers in managing the waste of our cities, and elucidate the issues of marginalisation. The photo exhibition titled Daastan-e-Nayandahall: Notes from the Plastic Recycling Hub of Bangalore, is an attempt to engage the general public with recyclers of Nayandahalli and hopes to bring to fore issues of space, the need for recognition of recyclers; present the changing landscape of the area following recent constructions and erase the binary between waste and resource. The year-long project, have chronicled over 2500 photographs and this exhibition, showcases 49 select photographs to reveal the stories from the plastic recycling hub of Bangalore. Photographs of life in Nayandahalli have been taken by Pinky Chandran and Marwan Abubaker. Meet Akmal Pasha, the leader of an informal organization of godown owners in Nayandahalli; Salma, a volunteer of Hasiru Dala, waste sorter in the godowns of Nayandahalli; Siddique, volunteer of Hasiru Dala, a tempo driver, transporting waste from godowns to reprocessing units, Zareena, Home-based waste sorter; Annama, Operator Dry Waste Collection Center and Kokila and Mallika, organic and event waste manager respectively. (Salma and Siddique also hold the unique distinction of being the country’s first husband and wife informal waste-workers Radio Jockey). They will be narrating first person account of their work and how they transform waste in resource. The conversation will be moderated by Nalini Shekar & Kabir. Join us for an evening of stories in different languages – English, Hindi, Kannada. Translations will be done, as and when required. Venue: Indian Institute for Human Settlements, 16th Cross, Sadashiv Nagar, Bangalore.